One of Pennsylvania's first interstates to be built, Interstate 83 began as the Department of Highways upgraded US 111 to an expressway. Construction on the first section between Exit 33 and Exit 39B began in 1950. Two years later this section opened and was christened the Harrisburg-York-Baltimore Expressway. Also in 1952, construction began on the sections between Exit 39B and Exit 41B in Lemoyne and between Paxton Street and Exit 50. In 1954, those two sections were opened to traffic while construction began on the part between Exit 28 and Exit 32. In 1955, the section between Exit 28 and Exit 32 opened to traffic and the section of US 111 between Exit 32 and Exit 33 was upgraded to an expressway. In 1956, construction began on the section from Exit 22 to Exit 28 and opened to traffic in 1958. The operative word at the Department of Highways in 1958 must have been "completion," as construction began on most of the remainder of the expressway: Maryland state line to Exit 22 and Exit 41B to Exit 45. The latter segment included the Susquehanna River crossing known as the John Harris Bridge. The following year, the section from the Maryland state line to Exit 16 opened. Not only did the expressway receive the I-83 designation in 1960, but more sections opened to traffic: Exit 16 to Exit 22, completing the bypass of York, and Exit 41B to Exit 43. In 1961, the section between Exit 43 and Exit 45 opened to traffic with a twist: the expressway was completed, and the US 111 designation moved onto it and the northern terminus from Lemoyne to US 22. Interstate 83 would "fly solo" for the first time in 1963 when the US 111 shields were taken down, leaving only one designation. However, the Interstate was not complete by today's standards. In 1968, construction began on the sections from Exit 45 to Exit 47 and Exit 50 to Exit 51. Two years later, the latter would open to traffic but the Exit 45 to Exit 47 segment would take a little while longer. The reason being is that it involves the massive Eisenhower Interchange, one of the most complex if not largest, in the Commonwealth. This last section would open to traffic in 1971. A picture of it was featured on the cover of the 1972-1973 Department of Transportation map seen at the left. In the late 1990s there was talk of extending I-83 northward to Williamsport and further. Since PennDOT has been rebuilding US 15 north of the city as an expressway, and with many expressway sections between it and Harrisburg, an extension of the designation seems appropriate. However, the US 15 widening projects near Amity Hall did not result in an expressway and is an at-grade, four-lane highway with a turning lane in the middle. PennDOT has no plans to upgrade the highway to expressway standards; therefore, the Interstate designation could not proceed any further than Clarks Ferry. 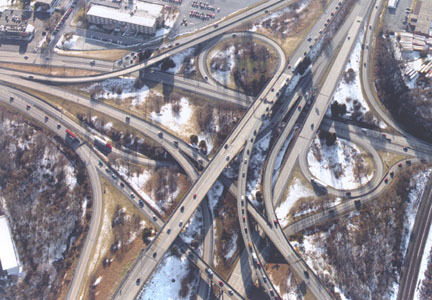 In July 2001, work began on rehabilitating the bridges within the Eisenhower/Hershey Interchange. The $4.7 million project will be conducted in stages over the next four years and includes concrete repair, replacement of expansion joints which are worn and need to be replaced, and updating the guide rail. The project is scheduled to be completed in June 2004. An unusual accident took place on the morning of November 19, 2001, when a tractor-trailer carrying 8,400 live chickens lost its load on Interstate 83 southbound ramp in the Eisenhower Interchange at 8:30 AM. The driver said that he was going around the bend when the trailer tipped, and spilled the crates of live chickens onto the highway. Some of the chickens fell onto the Interstate, while others landed on the railroad tracks below. Cleanup crews acted quickly to get the birds off the highway; however, it still had to be closed for about 45 minutes and trains delayed for hours as they worked to clean up the mess. Time was beginning to take its toll on the expressway by 2003. In March of that year, PennDOT began repairing and resurfacing the Interstate between Exit 19 and Interstate 81. The project also involved doing the same to Eisenhower Boulevard, Paxton Street, and a portion of Derry Street between the on- and off-ramps with Interstate 83. The overlay used is called Novachip, which is a very thin application of asphalt that seals and protects the underlying concrete from water damage and deterioration. It also increases traction for vehicles and prevent skidding. The project was originally scheduled to conclude at the end of 2004, but due to unusually wet weather during last year's construction season and cool temperatures in the fall, the project stretched into 2004 and ended in June. The cost of the project was $9,825,862. One of the problems with Interstate 83 is that it is a narrow expressway, because it was built before the construction standards for Interstates were created. However, it isn't too late to undo the mistakes of yesteryear. PennDOT began a rehabilitation project in the area of Exit 14 and Exit 15 in York in May 2003. The project included: improvement of existing geometric conditions, signals at ramp intersections, construction of turning lanes at ramp intersections, widening and realignment of ramps, pavement rehabilitation and resurfacing, and bridge improvements. The project concluded on December 6, 2006 at a cost of $58 million. It takes a really big snow storm to close roads and that is exactly what hit on February 9, 2010. Governor Rendell took proactive measures and closed I-83 at 2:00 PM the following day. In a press release he stated, "For your safety, do not drive. You will risk your life and, potentially, the lives of others if you get stuck on highways or any road. The National Weather Service issued blizzard warnings for several counties in Pennsylvania and visibility is at or near zero. Motorists must stay off Interstates 81, 83, and 78 until my administration lifts the restriction," which happened on February 11. A project to improve safety at the PA 124/Mount Rose interchange (Exit 18) in York began in 2012. Work will entail widening and rebuilding sections of Interstate 83, PA 124, Camp Betty Washington Road, Haines Road, and Green Hill Road, reconfiguring the interchange itself, construction of four new bridges, replacing and widening three exiting bridges, widening of three existing box culverts, construction of a new box culvert, and installation of two new sound walls. New traffic signals will be installed at six intersections, updated drainage and guiderails, signing and pavement markings, and new highway lighting round out the $58.3 million project which is projected to conclude in Summer 2018. One of the most heavily traveled sections of the Interstate is from the Turnpike into downtown Harrisburg and north to Interstate 81, which was the focus of a study that concluded in 2003. It was estimated that it would cost $1 billion to rebuild all of the 11 miles at once, so instead improvements were broken down into separate projects. The first was improving the section from Exit 40B to Exit 42 in Cumberland County where three off-ramps and two on-ramps would be removed or reconfigured. At Exit 41B, the southbound off-ramp would be removed and a longer acceleration ramp would be built in place of the existing ramp to Interstate 83 southbound from PA 581. The Lemoyne interchange, Exit 42, would be removed completely, and the Highland Park and Lemoyne exits replaced with a new ramp to Lowther Street. The bridge carrying PA 581 over South 10th Street would be replaced as would the bridge carrying Lowther Street over I-83, but the biggest part of the project is the addition of another northbound lane between Exit 40B and the John Harris Bridge. Crews closed the former Exit 42/Lemoyne interchange on the night of July 31, 2014, which was the last exit before the John Harris Bridge. Construction began on August 12, 2013, and the $22.1 million project is expected to finish in Summer 2015. This as well as future projects, made possible by the passage of Act 89 in November 2013, such as widening and reconstructing Interstate 83 between Union Deposit Road and Interstate 81, redesigning and reconstruction of the Eisenhower Interchange, and widening of the Interstate between the John Harris Memorial Bridge and the Eisenhower Interchange were all part of the revised 12-year plan announced on August 14, 2014. The widening of the bridge will not involve any construction, but rather reconfiguring the current three lanes into four by eliminating the shoulder. The new lane will connect the New Cumberland on-ramp to the Second Street off-ramp, with the Lowther Street on-ramp merging into the new lane. Project website: http://www.i-83beltway.com/. Mine subsidence has been an issue with highways across the state, but it was a metal culvert causing problems for a section of the Interstate in York County just north of the Maryland state line. Work to repair a culvert was scheduled for February 28, 2014 due to a dip in the southbound lanes that occurred over the preceding week. After excavation to repair the damage uncovered a void of 13 inches deep and eight-feet-wide under the right lane and extending into the left lane, PennDOT closed the southbound lanes of the Interstate at 1 AM on the morning of March 1. Repair work continued until the morning of March 2 when the roadway was reopened at 1:30 AM. Repairs took place the following weekend to stabilize the northbound lanes beginning on the night of March 7 and concluding at 8:40 AM the following morning. Page updated October 27, 2015. Information courtesy of the Pennsylvania Department of Transportation, the Easton Express-Times, United Alert, WGAL-TV Lancaster, and the York Dispatch.